This morning I heard that the African National Congress was having an urgent meeting with First National Bank because of their advert 'You can help'. Their press statement expressed dismay that the Bank would put together an advert of this nature, and in true political heavy-handedness they are seeking to 'engage' the bank. I wish it was to engage the bank to hear how they can improve governance, how they clean up their public image, and how they can better serve the nation. But, sadly it is not. The press points out that they are meeting with FNB to chastize them for expressing their concern about what is happening in our nation and asking the citizens of the nation to stand up and make a difference, in spite of the governing party and the government. I think it is great that citizens and big business are taking a stand! This is our nation, as well as theirs, together we can make a difference! Here's the advert - you can help! Have you ever wondered who the biggest twitter users are in South Africa? Who has the most followers, what city has the most twitters posts, and what subjects are most discussed by the South African twitterati!? I was alerted to a fascinating piece of research by Fuseware yesterday - this would seem to be the first extensive research on the use of social media and twitter in South Africa. You can download a PDF of their slides here. I'd love to hear how you use twitter - as you may know I have taught numerous classes on the uses of social media for ministry and twitter is a central part of that strategy - particularly if you're trying to communicate some ideas, build a movement, or create a strong community. God bless! Keep tweeting South Africa! Tie a yellow ribbon to your blog or website Today. It is a sad day, an attack on our freedom is being made. In honour of press freedom, tie a yellow ribbon to your blog or website. To add a ribbon to your website simply right click on this image, save the location, or save the image to your hard drive, then add it to your blog posting. Email me (see the link on the right) if you would like me to email the image directly to you. For a full article describing the problem please see the Dispatch Online blog. Oh, and we've also had no telephone lines whatsoever since a storm on Saturday. So if you phone my office it will simply ring... Telkom says they'll attend to it, but 4 days later there is still no sign of a technician. If you're thinking 'how can Dion be blogging without a telephone line and power? ', well, I am sitting in my 1 year old car at Hatfield Volkswagen (fourth time in two months with the same electrical fault) - this is a 'moblog', submitted via email from my Nokia E90 cell phone. Free tickets to the World Cup Rugby final! Do you want tickets to the world cup Rugby final? Well, there may just be someone who can help you with that! Take a look at picture below! Now, how's that for a suggestion? 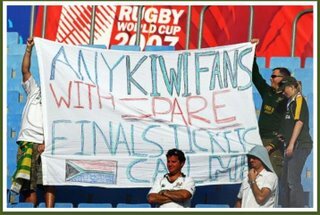 Come on Kiwi's you know you don't need them! Send them our way!